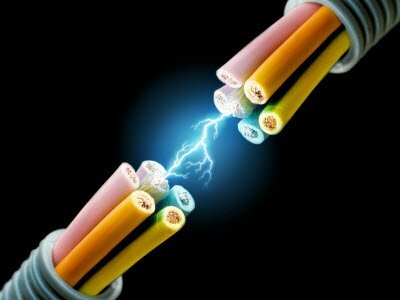 Electrical engineering is a branch of engineering that involves a different power or energy form to run the entire world. Every electrical engineering student needs to work with energies such as solar energy, geothermal energy, wind energy, gas and turbine, etc. 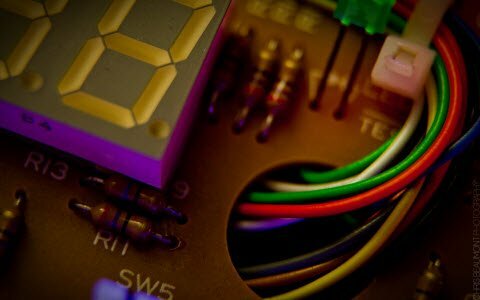 If a student wants to work on particular electrical mini projects during his course, In this article, we are providing a few electrical mini project ideas with circuit diagrams. 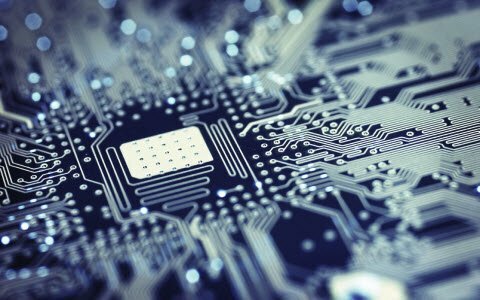 In this article, we are providing a few electrical engineering project ideas that help students design electrical projects on their own. 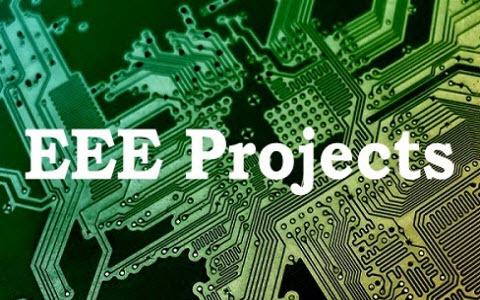 Electrical and electronics mini projects can be built using various electrical and electronic components. These circuits are used to design mini projects for EEE students.Here, we have explained some eee mini projects with circuit diagrams. A cell-phone detector circuit uses high frequency ranges from 0.9GHz to 3 GHz. This circuit uses a disk capacitor (C3) 0.22 μF according to the RF circuit to ensure the circuit’s capability to capture the mobile signal. The cell phone detector can sense any activity of a cell phone voice transmission or video transmission including incoming SMS or outgoing SMS. The capacitor C3 should have an 18mm lead length with 8mm spacing between leads to attain the desired frequency. This capacitor acts as a small GHz loop to collect the RF signals. The Op-Amp CA3130 is used as a current to voltage converter. 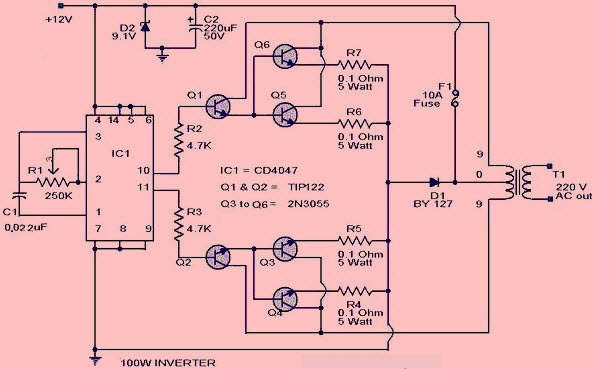 This cell phone detector circuit can be used to confirm the existence of an active cellular phone in the tested area. Generally, a battery is charged with a small amount of AC or DC voltage. If we want to charge the battery with an AC source, we need to first limit the large AC voltage, need to filter the AC voltage to remove the noise – regulate and get the constant voltage and then give the resulting voltage to the battery for charging. Once charging is completed the circuit should automatically be turned off.. The AC voltage is given to the step-down transformer to step down the voltage to 20V approx. This voltage is given to the SCR for the rectification of the voltage. The rectified voltage is used to charge the battery. The battery attached to the charging circuit doesn’t completely get dead and get discharged. This gives forward bias voltage to the transistor, resistor R7 and diode D2 which get switched on. When the transistor is switched on, the SCR switches OFF. 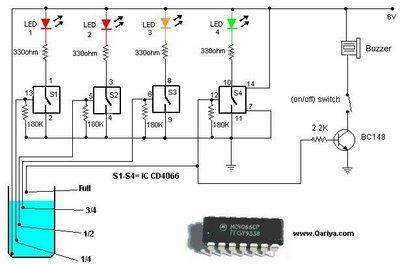 When the voltage of the battery is dropped, the transistor gets switched off; the resistor R3 and diode D1 get the current to the gate of the SCR automatically; this triggers the SCR and it conducts. The AC input rectifies the input voltage and give it to the battery via R6 resistor. This charges the battery; when the voltage drop in the battery decreases, the forward bias current also gets increased to the resistor. When the battery is fully charged, the Q1 transistor turns on and off the SCR. The water level indicator project is used to display the information about the level of the water tank by using LED lights. This project mainly uses IC CD4066 and the circuit diagram of water level indicator is shown below. 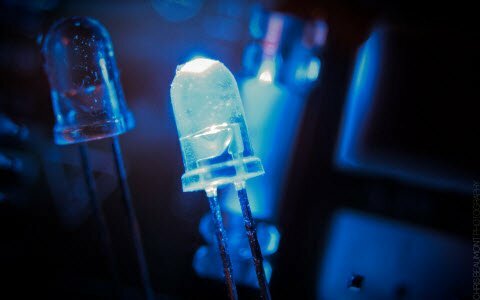 This circuit is built with four LEDs. When the water level is at ¼ of the tank, then LED1 glows. When the water level is ½ of the tank, then LED2 glows. When the water level is at ¾ of the tank or the water level is full, then the LED4 glows. 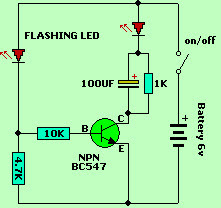 This super-bright LED flasher circuit uses a single driver transistor, which takes its flash rate from a flashing LED. The flash light cannot be changed by the brightness of the white LED. This LED can be adjusted by changing the resistor 1K across the 100u electrolytic to 10k.The 1K resistor discharges the 100u. So that when the transistor turns ON, the charging current into the 100u illuminates the white LED. If a 10k discharge resistor is used, the 100u is not fully charged and the LED doesn’t flash as bright. All the parts in the photo are in the same place as shown in the circuit diagram, thus make it easy for us to see how the parts are connected. 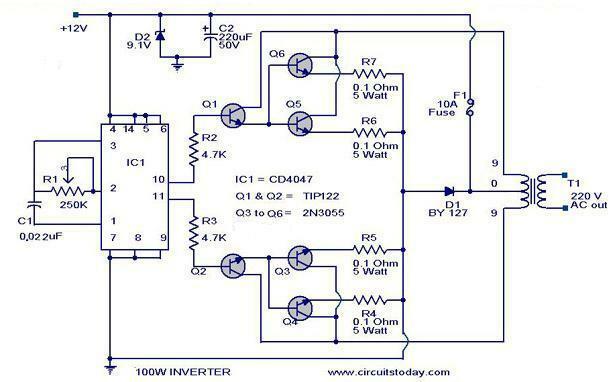 The fridge door alarm circuit bounded in a small box must be placed in the fridge close to the lamp. When the fridge door is closed, the inside of the fridge gets dark, the photo resistor R2 presents a high resistance (>200K). Thus, clamping IC1 by holding C1 fully charges across R1 & D1. When a light beam enters from the opening, the photo resistor presents a low resistance (<2K). So, IC1 wired as an astable multivibrator, starts oscillating at a very low frequency; and, after a period of about 24 seconds, its o/p pin goes high. The IC2 chip is also wired as an astable multivibrator, driving the Piezo sounder irregular at about five times/second. The alarm is activated for about 17 seconds, and then stopped for the same time period and the cycle repeats until the fridge door closes. The IC1 CD 4047 wired as an astable multivibrator produces two 180 degrees out of phase 100Hz pulse trains. These pulse trains are pre amplified by the two TIP122 transistors. The o/p of these transistors is amplified by four 2N 3055 transistors. 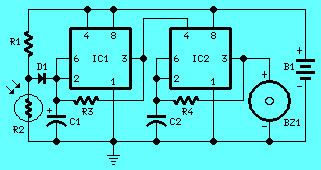 For each half cycle, two transistors are used to drive the inverter transformer. This is all about a few simple electrical mini projects with circuit diagrams for all those individuals who are interested in building their own electrical mini project circuits. 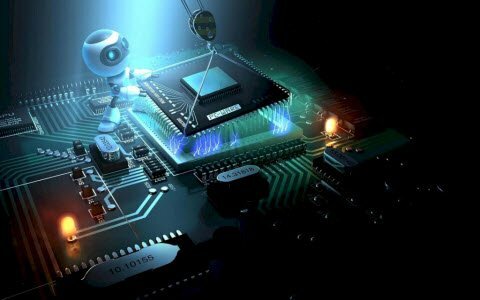 We hope this type of electrical engineering project ideas will be helpful to the students.Furthermore,for any queries regarding this article or electronics projects, eee mini projects with circuit diagram please do give your comments, feedback and suggestions in the comment section below. Thanks a lot. It’s very easy and simple project. I have done “Water Level Indicator” project for my college. My Faculty is very happy to see my project. My family members are also happy to see that, Thanks again dear. can u give still simple project………. please visit our domestic website https://www.edgefxkits.com/ and international website http://www.efxkits.com/ for more simple projects. 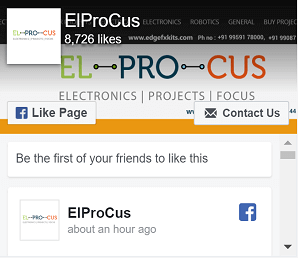 Please check the user friendly website http://www.edgefxkits.com for project ideas on all the latest technologies. Please check the user friendly website for complete details in the kit content section and go through the FAQ for details. Further if you have any queries you can mail us at info@edgefxkits.in or please call on the toll free no. 1800 108 7475 for clarifications/personal counseling.